What is the process involved in installing a Geothermal System? Our Geothermal Systems include a room-by-room analysis of your current home and window layout to provide us with the load capacity needed to engineer a heating and cooling system that is sufficient for your home. After careful surveying of your property we mark out the well location(s) and explain the trenching and excavation that we will be necessary from the well locations to your home. After proper permitting is done, we will mobilize our Drill Rig to the proper well locations and begin drilling. When the drilling of a borehole is complete we will fill the geothermal loops with water and lower them into the hole. We then fill the borehole with bentonite grout to ensure that proper heat transfer is contained within the loops. 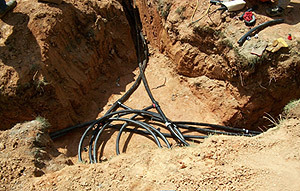 After excavating a 6 foot deep trench from the well location(s) to the home, we will install geothermal pipe in the trench by using IGSHPA approved fusion techniques, connecting each geothermal looped well with the Geothermal Heat Exchanger located inside your home. After proper purging, flushing and pressure testing of your system, we will hook the loops up to your interior unit, ensure proper heat distribution throughout your home, and answer any questions you may have about your energy-efficient heating and cooling system. The earth maintains a constant temperature of approximately 54° Fahrenheit. As the water inside the loops circulates through the loops, it rises to that 54° temperature. The water travels through the loops and into the Geothermal Unit inside your home. The Geothermal Heat Exchanger then extracts the warm water molecules out of the water and uses that energy to heat your home. The unused water molecules are then sent back down the loop into the earth, where they continue the heat exchange process to give you the temperature that you desire within your home. In the same manner, during the summer, the cool air molecules are extracted from the water and used to cool your home. This process saves on fuel consumption, eliminates smoke and other pollutants from being put into the air and saves you money. Don't spend Thousands of dollars replacing a Heat Pump that will cost you Hundreds of dollars per month to use!!! !